Experience beautiful Seattle, Washington with children on this fun day inspired by a beautiful city. See all the the Pacific Northwest has to offer kids in a family-friendly day centered around education and national landmarks. See Washington State as a family and come back with memories to last a lifetime. The whole family will have a wild time at Woodland Park Zoo. With over 1,090 animals from 300 species, this zoo is packed with excitement. See amazing jaguars, gorillas, monkeys, toucans and other exotic animals at The Tropical Rain Forest exhibit. The Tropical Asia exhibit houses “The Elephant Forest,” home to giant elephants. Visitors can walk along the “Northern Trail,” which travels through the northern habitats of tundra, taiga and montane. The “African Savanna” exhibit is home to giraffes, zebras, lions, cheetahs and other African animals. Young visitors will enjoy exploring “Zoomazium,” an interactive nature-themed playspace for children. Enjoy a 360 degree, breathtaking view of Seattle from 520 feet in the air. 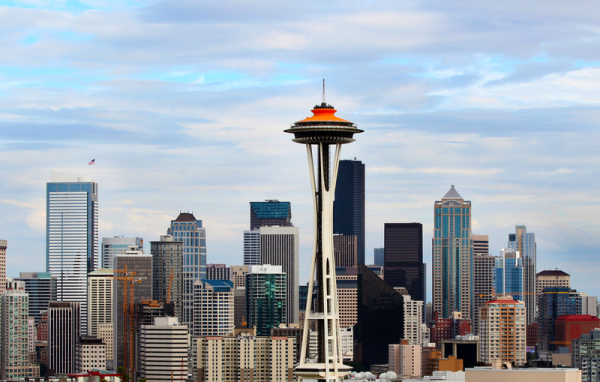 Built in 1962 for the World’s Fair, the Space Needle is a symbol of Seattle and a historic landmark. The structure is built to withstand winds up to 200 miles per hour and has 25 lightning rods. The rotating observation deck provides spectacular views of the city. From the top of the Needle, visitors can see the Seattle skyline, Olympic and Cascade Mountains and surrounding islands. The Space Needle also features the SkyCity restaurant and a gift shop. Visitors of all ages will enjoy visiting the largest private air and space museum in the world. The Museum of Flight has more than 150 aircraft in its collection. Children will have a blast climbing into the cockpit of a real SR-71A Blackbird reconnaissance plane, the fastest and highest-flying jet ever built. Explore World War I and World War II aircraft and learn how fighter planes evolved over time. The museum’s children’s exhibit, Kid’s Flight Zone, teaches children what it takes to control a flying machine. This is one unique museum you won’t want to miss. Interested in booking or planning a vacation to Seattle right now? Check out some of the amazing offers currently available for airfare and hotels at Kayak, Orbitz and Priceline. See more lodging options at Hotels.com and Hilton. Get started on your next trip today!